Sonic and the Social Network | 2P START! It seems like our Black Doom Awards are fertile grounds for comic ideas! Obviously, Ray’s Black Doom Award this week was the inspiration for the comic. It was fun to think through what Sonic’s page would really look like if he were real (sorry Ray, he’s not), although Ray would probably agree here that this was harder than we thought it would be. Actually, something else to say, I love these sort of comics, because there’s all sorts of subtle details that make it funny, things like Black Doom posting at an hour that doesn’t even exist (if you wanted to do a real time, you should’ve done 4:44, that’s apparently Japan’s 13), and Sonic’s notes. I have a lot of comments on this one…umm…how exactly is that Tikal? Does she do some teleport-y thingy that I’m not aware of? It’s a spoiler of sorts from ‘Sonic Adventure.’ Remember those glowing orbs you touched for help? Remember the voice? This is great! Good attention to detail guys! One of my favorite comics so far. Oh, and I love that Chip uses all capital letters. This is BY FAR on of the BEST comics I have seen on this site, hands down!! From now on, every time I say “this comic used to be good”, know that THIS comic is what I’m referencing! Vaguely. It’s been a while since I played it, and I only played it once. But I know enough of what you’re talking about to get it. Every time I scroll up, I notice another joke. Fantastic job! On a separate note, I think this comic accurately depicts the current state of Sonic the Hedgehog. Very nicely done. Now I’m just worried that with every new post, there’s a joke I missed. – And why is the “Just Friends” button “Just Classic Friends”? AWESOME COMIC GUYS!!! PRESS “A” BUTTON TO JUMP!!! – Why does sonic have a Pokemon application bookmarked on his bar? He got hooked while in Brawl. And why is the “Just Friends” button “Just Classic Friends”? Helps filter out many of the new characters that really mean nothing to him. You forgot ads! You could have totally made some really amusing ads, like advertising the latest Mario game! Thought about it – but our comic was limited to this width. I had to squeeze what I could in already. Oh yeah, and last I knew you couldn’t make a transparent profile picture. Believe me, if I could, I would. It is possible – in a way. At one point I made an image that included the background, then made sure it lined up correctly once uploaded. Sonic’s sly like that too – so I’m sure that’s what he did. I think that this is a great comic. Honestly, it’s been said, but it warrents being said again. it is the specific attention to detail that really makes these kinds of comics funny. Its the little things, like what sonic is currently listening to, and snively Kintobor that really made me laugh. Great work guys, in fact so good, that I won’t hide my comment behind a bunch of anagramed letters! Nice way to approach an video game based comic. Guess thats because im not really into this facebook stuff. See u next week, keep the good work. so many jokes into one! I loved the insane amount of sidekicks instead of friends. and the notes im going back to my roots and the Just Kidding, this time im really going back to my roots. This is a great comic! It looks exactly like a facebook page! But there’s just one more thing I would have done to make it funnier . . .
All I have to say is….this comic use to be good…. Haha, good comic this week guys. I found the Chip’s similar stories particularly funny. Anyways, nice comic! I loved this one, and all the small details you put into it like Kintobor liking Eggman’s post. But there’s no new Banner yet 🙁 Oh well, the comic was still great and I’m sure there will be a banner soon. *Ignore the “the” in front of “Chip’s”. I’m a moron. Also, I am pretty sure that Snivly was never given a last name considering that Kintober was Robotnik’s last name (before the fateful day when the tremor in the Earth disturbed the chaos emeralds, fusing their energies with Dr. Kintober and a half eaten egg, thus changing him into his current shape and somehow changing his name). HEY PEOPLE LOOKING AT THIS PAGE, CLICK THE RED BUTTON IN THE TOP-LEFT CORNER TO STOP YOUR EYES FROM BLEEDING. This comic is hilarious!!! Keep ’em comin’!! I like all the subtler jokes, like “6:66” and “7 similar stories”. This was hilarious, I was on Facebook at the time when I read this, and I actually laughed out loud. There were more than 10 jokes on this, and I was looking around for ages. My favorite was the Shadow joke. You grasped him perfectly. Awesome Comic Guys! When I first saw this, I thought it was a popup or something. 😛 All the small jokes and references make this comic one of my favorites. Here is the 2pstart that I love. Thanks for the great comic. The joke is much better than the last comic. So I can safely throw away my comment from last week. hmmm… Kill Tim and Ray? Hey, Anyone want to take this Opportunity up? I feel a mutiny coming on.. Avast!, I Shall protect them! Ha, I love the amount of detail in this one. Great job guys! I can see Sonic uses that popular pokemon application. or is it really Ray? Epic. Great job guys. I love all the little jokes in it. Great comic, I love all the hints everywhere makes me laugh at the number of sidekicks! You are missing his name next to settings, but that would have taken too much space…. Don’t recognize the top right. When I read this… I had 16 friends online too O_O. Here is the 2pstart that I love. As opposed to having original art and not simply being a Photoshopped screenshot of a massively popular website? Of course, I’m joking. Parodies are my favorite! Seems like no better time then to post this, haha. Great comic guys, and thanks for getting back to my emails the other day. Wait, you mean he’s not? OMG I LUVVEE THE BANNER, BEST EVA!! This specific one is one of my favorites now, I bet there will be copycats springing up everywhere soon. It’s the bubble that pops up when you get a new announcement on Facebook. 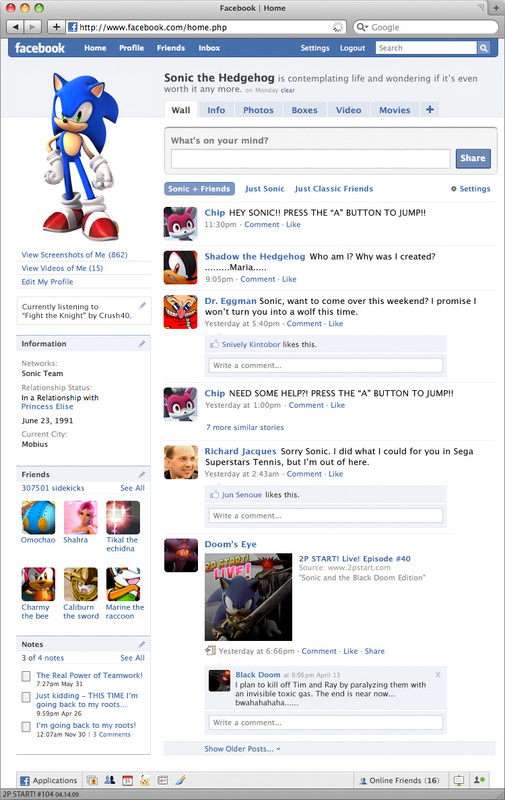 Ooh, I’m dying to ‘like’ Sonic’s status. Wtf? How did that first quote get in there? …That’s right. Sonic is really…RAY HARGRAVES! NCG! Every piece of text in the comic is hilarious! BTW: I wrote this comment on my DSi! Good Job. Have fun playing for less time while I play Ds and gba games for longer. Also a question (srsly) how many megapixels is the camera. Why doesn’t this comic show up on the archives, or have a name at the page title? I dont really know how many MP it is, but the 0.3 MP seems about right. I think the picture quality fine though. I never really play gba games anymore, so it doesn’t bother me,i can play them on my old GBA if i want, and SD cardsupport & DSi ware is worth the trade in. Sonic uses Facebook AND a mac?!?!? It all finally makes sense! Is the fact that the poison gas was invisible the thing your gonna make fun of from Shadow? That’s possible. What about the fact that it paralyzes everyone, but in the next scene they can all give you helpful words of encouragement? Because everyone knows that when you talk, you don’t use any muscles whatsoever. Press the “A” button to jump! Can I keep this up jumping? Press the “A” button to jump! OMG amazing. 😀 Totally great. I’m not sure if he’s gonna get yelled at, or get comment of the week. Although I think he’s a little late for mention in the podcast, though. Just listening to the podcast, and I have to say I assumed at first that Tim, with all of his l33t html skills, just locally saved the html and stylesheets of your facebook page, swapped out the text and images in the html and was done with it. Sounds like poor Ray had to spend a long time on the photoshop (which is very convincing!). If this were the forums, I’d be all over his case on spamming. But this is Tim and Ray’s territory. Why does it say “In a relationship with Princess Elise”? Also, sorry to say it, but I’m not really impressed with the Marine picture. You can only see half of her face! It was the only relationship Sonic’s had that could truly make people groan. So I figured why not bring it back? lso, sorry to say it, but I’m not really impressed with the Marine picture. You can only see half of her face! 6:66 could just be in metric time. Secondly, this comic is perfect apart from the fact that you used Safari. HEY SONIC PRESS THE ‘A’ BUTTON TO JUMP! I gotta see this page. Can someone provide a link, please? I couldn’t find it by searching Facebook. This would’ve been better if Eggman’s comment was PINGAS!